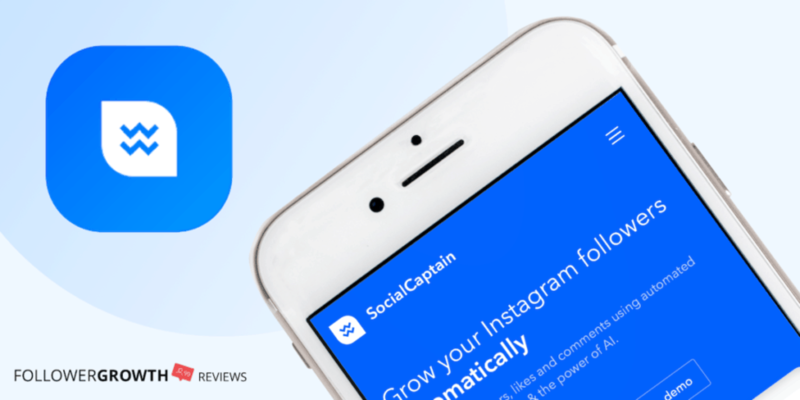 Social Captain Review: Is It the Best Instagram Bot? Looking for a way to get free Instagram followers? While researching Instagram automation tools, I kept coming across Social Captain. I found myself wondering if Social Captain is the best Instagram tool out there, or maybe it’s more marketing hype than actual facts? If you’ve just started reading and are looking for the best Instagram automation tools… read this article first. Otherwise, in this Social Captain review I will get to the bottom of what the tool is about. When you’re done reading this review you will be familiar with: all the Social Captain features, how it works, whether it can deliver or not, if it’s a recommended tool, or if there’s a better alternative. Two tools I’d like to mention right off the bat are KENJI (I go in depth into this one later as an alternative) because it’s cheaper and does the same thing. Without further adieu, here’s my feedback on Social Captain and whether you should be using it. The main concern you have with Instagram automation tools is that they’ll perform too many actions and trigger Instagram’s anti-spam filter, ending up with a banned account. Nobody wants to lose their Instagram account, especially if they spent years working on it. Social Captain is a bot, and it can perform a rather high number of actions on your account in minutes, such as Like images, leave comments, follow and un-follow, and so on. As a precaution, I suggest setting the speed to Slow at first, because if you dive right in on the highest speed, Instagram will flag your account as suspicious. It certainly is suspicious to perform 2,000 + actions within 24 hours! How Does Social Captain Work? Social Captain is a script that runs on your Instagram account, within parameters that you set inside the tool’s dashboard. It works much like other automation tools; you can choose the type of actions you want to perform, the target audience, target hashtags, set the speed, and more. Create an account by entering your name, email address, and password. They offer a 24 hour free trial, so you can sign-up with no commitments. Then allow the program to connect with your Instagram account, and you’ll be taken to Social Captain’s dashboard. Once you connect your account, their on-screen tutorial will show you how to find the settings you need and walk you through the process. Very beginner friendly. Why? Upleap hires professional social media managers to manage your Instagram account for you. Nothing artificial here, real people working on your account. If you’re paranoid about bots and getting banned for spam-like behavior, this is the right tool for you. You can rest easy in the hands of Upleap’s account managers. The main advantage Upleap has over Social Captain is Upleap uses humans, specifically, professional social media managers. That’s something a bot won’t be able to copy, at least, for a few more years. KENJI is the opposite, at least in terms of human managers. KENJI is a budget-friendly Instagram bot which uses machine deep learning and AI to manage your account for you. It doesn’t repeat the same action over and over, it creates random patterns, and learns from how you interact with your account. Very cool. KENJI and Social Captain are quite similar, as in, they’re both online-based Instagram bots that can be toggled with a click. However, I would give the upper hand to KENJIhere, although it’s less popular, it’s much cheaper, and it works practically the same. Let’s take a look at some of the tool’s features, starting with the dashboard. ⭐⭐⭐⭐ – Easily Toggle the Services You Need. As mentioned earlier, the Quick Settings allow you to quickly toggle certain activities. 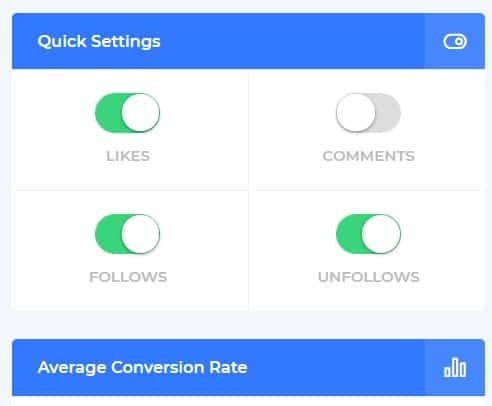 These are the four settings: Likes, Comments, Follows, and Un-Follows. Most of them are quite self explanatory, but the comment feature is a new one I don’t see often, and it’s a great way to get free Instagram followers. With this feature, the bot will copy and paste a custom comment on images it comes across. According to Social Captain, commenting is one of the best ways to generate traffic to your account. Won’t the feature just spam bland comments like, “Nice Post!” or “Cool Picture!” on every image? The cool thing about Social Captain’s automated commenting service is you can choose the comments to leave, and have the bot rotate between a selection of comments. In other words, it won’t spam the same comment over and over. You can also use filters with the commenting service to avoid interacting with the same accounts over and over. Very cool. ⭐⭐⭐⭐ – Lots of Information. Social Captain’s dashboard is a lot more in-depth than most Instagram tools. Not only do they show detailed reports, but also your Live activity feed, conversion rates, and a section to quickly toggle your settings. In short, everything is right in the dashboard. No need to navigate to other pages to find the settings you need. Very user-friendly, I love it. Most Instagram automation tools only show a few details on your dashboard. 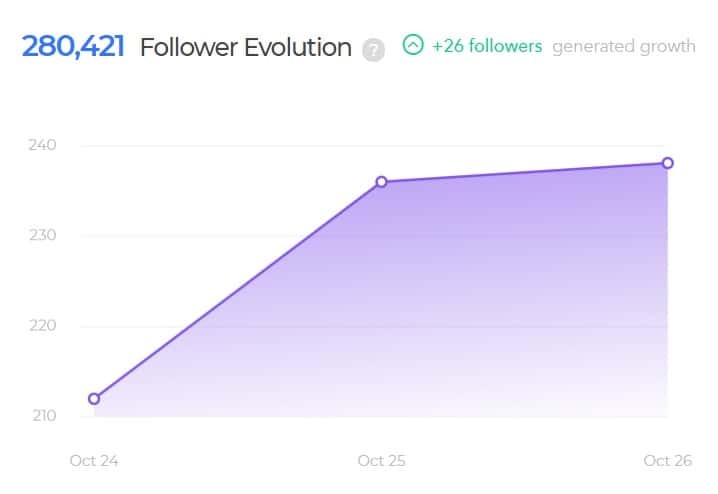 Social Captain shows practically every detail about your account and activity, it even shows details of all new followers (their number of followers, quality, and more). It’s always nice to know what the script is doing in the background. I also like how it shows your account growth right in the dashboard, complete with percentages and charts. It’s always satisfying to see your account grow in real time. An Instagram tool wouldn’t be complete without smart-targeting options. Social Captain provides plenty of targeting features, so you can end up with real people following your account. The tool won’t work unless you activate at least some targeting options, so it has somewhere to start. You can also choose to target accounts based on data-ranges, such as their follower range, comments range, likes, and so on. This makes it easy for you to avoid following accounts that are obviously spam. Although Gender Filter is for Premium accounts only, there are still plenty of filters to use, such as Media Age and Post Type. Combine these with the other targeting options and you’ll have some great settings for organic growth. If you’re feeling overwhelmed by the amount of options, simply click the Load Optimized buttons next to the desired feature, and they’ll take it from there. There is also the option to ignore low quality users, which is incredibly helpful because it filters out spam. There are a number of different ways the bot will rate an account, some of which are: no profile picture, low followers, low post count, etc. ⭐⭐⭐⭐⭐ – a Nice Surprise! Even with the free trial period you can connect and manage multiple Instagram accounts. Honestly, it came as a bit of a surprise. Use the trial period to get free Instagram followers! After reaching out to the customer support, they told me you can connect as many Instagram accounts as you want, and they even offer special discounts for social media managers. Although this service is only for Turbo members, it’s worth mentioning here. When this service is enabled, the optimizations use machine learning to replicate your past behavior and build on it. The exact details aren’t shared with the public, although they do claim it can improve your results by 350%. We can’t verify how useful this service is at the moment. Nevertheless, one could argue it’s not even needed, especially when the other services are running in the background. We mentioned earlier Social Captain includes a 24 hours free trial. However, it’s important to remember the countdown begins as soon as you create an account, not when you start using the service. So if you were thinking about making an account and trying out the service later, chances are your trial will expire before you get the chance, even if you don’t use any of the settings. I thought that was a little inconvenient. As you can see, the prices are reasonable, and for what they offer I think it’s a rather good deal. I also like how you can subscribe to short memberships to test out the service. There’s a good chance you won’t need the Turbo account, unless you have hundreds of Instagram accounts. Essentially, Turbo is the same as the other memberships, but it unlocks the Turbo Speed mode settings on all of the services. Turbo speed is supposed to be 10 times faster than regular speed. It also includes AI-Optimization. Overall, I think most small-time Instagram account owners will be happy with the Growth plan. It offers enough features to organically grow an account. Social Captain Reviews: What are People Saying? What do bloggers and Social Captain customers have to say about this platform? Do most people recommend it? Short answer: Yes! Most people like the tool. On Trust Pilot, the tool has an overall rating of Great (or 4/5 stars) with 65 reviews. Most reviewers (82%) rate the tool as Excellent. That is a good sign. While browsing through negative Social Captain reviews, the company almost always replies to negative comments and offers to resolve the issue as quickly as possible. It’s nice to see a company actively working to satisfy customers on review websites. As for bloggers, the vast majority of bloggers rate the Instagram tool a 9/10 and very few have complaints with the tool. In other words, almost everyone thinks the tool is decent and useful. Let’s run through some of the things we loved about Social Captain. Right on the dashboard you can see data such as: conversion rate, account growth, new follows, followers over-time, likes, and much more. Practically every bit of data is tracked by Social Captain and they make it very easy for you to find it. Once you set up the targeting options and filters, there’s not much else you need to do besides sit back and relax. Social Captain offers plenty of targeting features, most of which we already discussed. A couple are locked until you upgrade. What this means is the activity will “Look” like a real human is behind the account. The script will engage with accounts, follow them, leave comments, and like pictures – exactly what a human marketer would do. Most of the people who follow you back won’t even know you’re using an automated tool to interact with them. Great for organic growth. Social Captain’s customer support is top notch. They have a help center where you can find answers to most of the questions you have. On top of that, they have a ticket-support system as well as Live-chat support, so if you run into an issue it can be resolved in a matter of hours. I really appreciate platforms that have a strong customer support, so this company gets a thumbs up from me. P.S. Turbo membership includes 24/7 Live-Chat support. The other plans are limited to regular support. They replied to my email within 24 hours. Another feature about Social Captain I liked is the price, it’s downright cheap. It’s quite a surprise a platform offers more features and services than other tools yet charges much less. The best part is the payment plans are flexible too. You can even get a few days if you want. As someone who struggles with commitments, it’s always nice to have flexible memberships. Let’s not forget about refunds. If you accidentally upgrade or regret your decision there is a 24 hour window where you can request a full-refund, no questions asked. Very nice. There’s not much I didn’t like about Social Captain. In my opinion, it’s one of the best Instagram tools I had the pleasure of trying out. On the other hand, there’s one issue I have with the tool. What I mean by this is the 24 hour trial starts as soon as you connect your Instagram account, regardless if you activate the features or not. In other words, the trial can expire before you even have a chance to try the services. To avoid this, remember to quickly activate all the features and setup the targeting options, otherwise you might not get another chance. Not a free one, at least. This happened to me. I created an account, with the idea to come back to it later and customize the settings, but when I came back the trial expired. It was a little bothersome, although paying $15 for a week is not such a big deal. P.S. Gramista, a similar tool, doesn’t start the countdown unless you activate the services. Read my Gramista review here. Social Captain is a great Instagram automation tool, especially for social media marketers who have multiple accounts under their care. The features I liked the most are the reporting tools (graphs and conversion rates right in the dashboard) and the flexible payment plans. Thanks for taking the time to read this Social Captain review. Let me know what you think in the comments below, and if you haven’t yet, check out our article about the best Instagram tools of 2019. Timothy Gagnon is a blogger and Instagram enthusiast. When he's not scouting locations for his next Instagram post, he's searching for the best Instagram tools to grow his account.